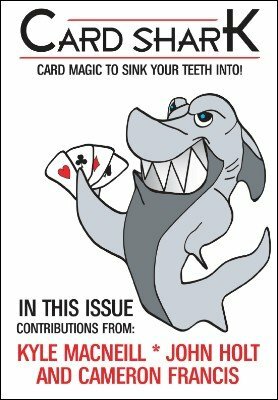 CARDSHARK is an exciting new monthly card magic digital magazine, edited and compiled by Kyle MacNeill. This is the first issue, and it is being sold for a special low introductory price of just $0.99! This issue contains 5 tricks from Cameron Francis, John Holt and Kyle MacNeill. Dessert first by Kyle MacNeill – A super–visual card trick with a nice ‘ending of the trick first’ hook. Walk around workers should like this one. (New trick). Super Quick ATFUS Hof by Kyle MacNeill – A streamlined take on Hofzinser Ace Problem. Easy to do and packs a punch. (New trick). Fight by John Holt – A kickass revelation of a selection mentalist and magician style. You will love the cool production of the selection. This first appeared in John’s Some things with Cards ebook. Joker Face by Kyle MacNeill – This first appeared in his collaborative Ebook with John Gelasi: 2 Can Play At That Game . It is a cool sandwich trick with a CAAN mixed in. Easy to do and fries laymen. Thank You, Meester by Cameron Francis – A brilliant transposition effect with a kicker ending. This first appeared in Cameron’s Continental Column in the Budget Magazine. 1st edition 2011; 13 pages.